Nassau County Legislators Rose Marie Walker and James D. Kennedy recently honored Massapequa resident Anthony Michael Cardillo of Farmingdale Boy Scout Troop 261 with an honorary citation at his Court of Honor Ceremony, where he became an Eagle Scout, the highest and most prestigious rank within the organization. Anthony’s Eagle Scout project consisted of building eight picnic tables for the Town of Oyster Bay neighborhood parks, including two that are handicap accessible. 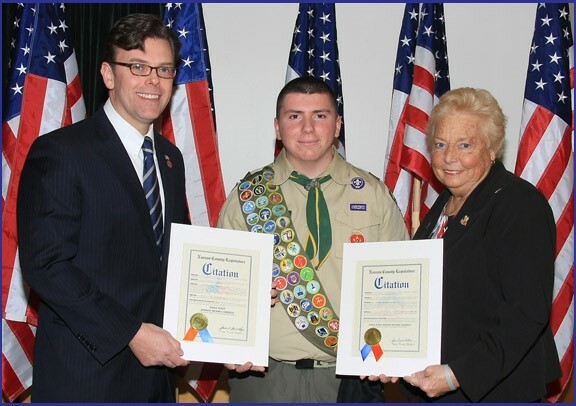 Pictured above, left to right: Legislator James D. Kennedy, Eagle Scout Anthony Michael Cardillo and Legislator Rose Marie Walker.